Feather Plucker! | Food It Yourself! Winter continues in Central New England. It is not as wickedly cold as it was in early January, but daily highs are only above freezing 50% of the time, nightly lows are generally between 10˚F and 20˚F. Furthermore, February is known for wild weather in this area. A blizzard could hit any time, or we could have a week with temperatures in the 60’s. As human beings with a reasonable level of intelligence and patience this season of crummy weather is tolerable for Mr. Food It Yourself and me. For chickens, it is a different matter. Here’s Agnes Featherduster after a few days inside. Her breathing is almost back to her baseline and her wounds are healing. that I mean they pecked at the feathers on her back and eventually drew blood. Yes, chickens are total mean girls and will peck each other to death. What could we do? 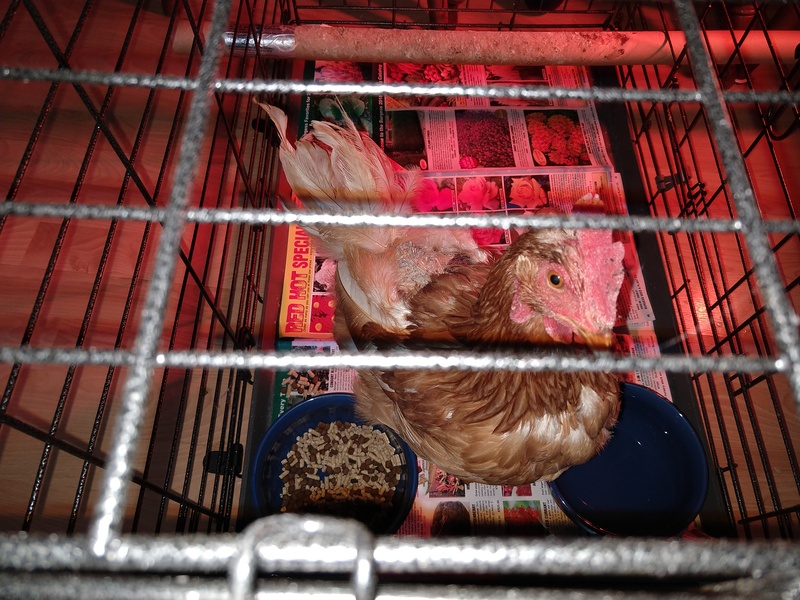 We were able to pull Agnes from the coop and get her set up inside before she was mortally wounded. We rinsed the cuts with a little sterile saline and used a no-sting “liquid bandage” to cover the really bad parts. She was wheezing badly (Agnes has had breathing issues as long as we’ve owned her, but this was worse than normal) so we put a little VetRx in her water and gave her a cozy spot under the kitchen table in a pet crate. That took care of the acute phase of the problem. However, there was evidence of deeper trouble in the coop. Mr. Food It Yourself noticed that Camilla (our γ-hen) and Madame Ovary (our β-hen) were also missing back feathers. Also notable was that Martha Clucker (the α-hen) was missing no feathers. It seems the ladies were all a little grumpy from being-in the most literal sense- cooped up and the pecking order was being enforced by sheer force. We had to counter attack on three fronts: nutritional, environmental, and social. I found this dispenser at the agricultural supply store with the small animal stuff. It came with wires that let it hang off the coop. Perfect! 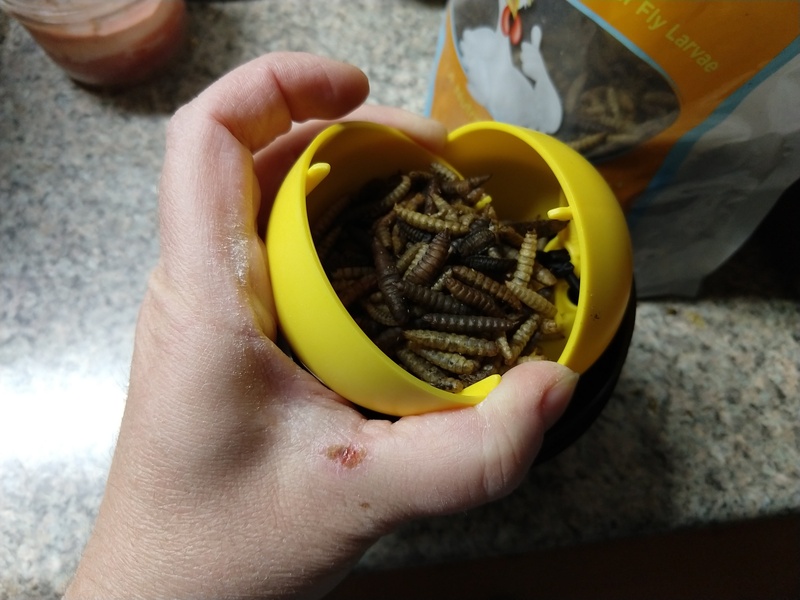 I filled this fowel ball with freeze-dried fly larva, which our hens love. They really need the hentertainment. tenders we know, mentioned two possible nutrient deficiencies, calcium and protein. These are easy enough problems to fix. We gave them a dispenser for oyster shell. 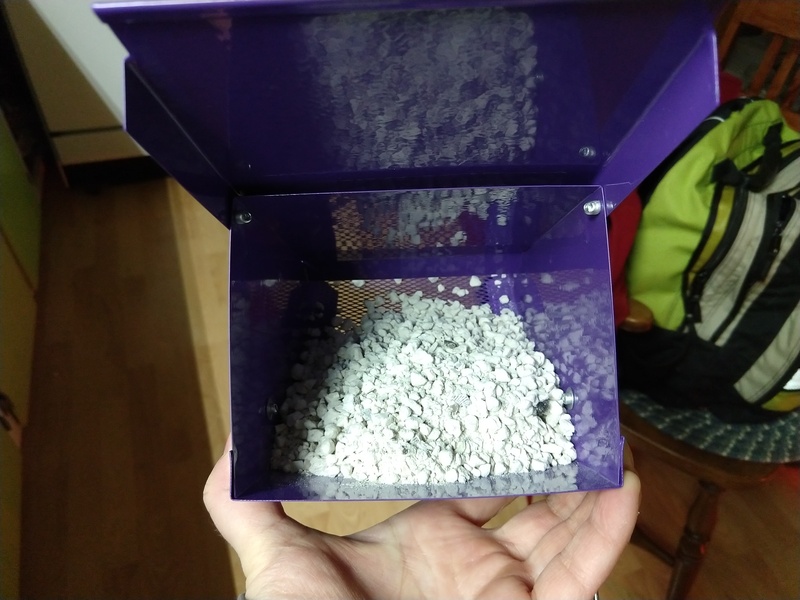 I bought a high-protein layer feed. Bonus- this feed is formulated to help chickens re-grow feathers. Environmental: Just like children, chickens tend to pick on each other more when they are bored. Giving our ladies more “outside” time is very hard this time of year. It is frequently too cold to let them out. Even if we do open the door to the coop they prefer to stay in where they are out of the wind, surrounded by straw and not forced to deal with the snowy, icy yard. A kind stranger at the agricultural supply store noted that he got his chickens some toys to play with, and it helped a lot. I picked up two and loaded them with high-protein treats. He’s super cute! And a total bada$$. A little more than we bargained for, actually. Social: If you really want hens to stop fighting you have to get a rooster. Since our neighbors live very close by and roosters are very noisy we first got a No-Crow collar. 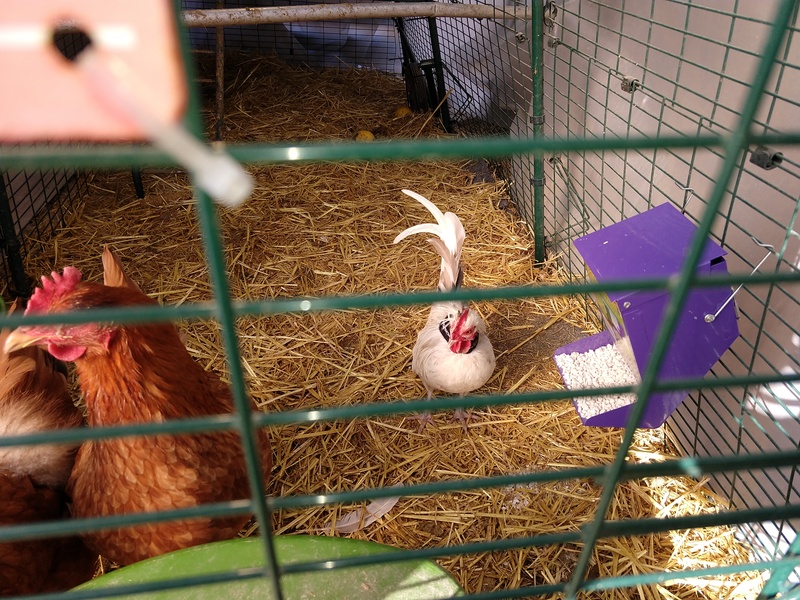 We then obtained an adorable bantam rooster from my friend Erin. He did not seem to mind the collar, but boy oh boy was he a feisty little guy. The outcome of these interventions? Agnes is slowly improving and has no signs of infection in her wounds. The hens accept the new feed and are pecking at the oyster shell. They really like the treat dispensers and sometimes roll them around even when the treats are gone. The best part is that Martha, Madame Ovary and Camilla are not picking on each other. That makes me happy. I can already Agnes’ feathers growing back in, too. The rooster…I will summarize. We tried to pick him up to adjust his collar. He got away from us and flew across the street. Mr. Food It Yourself and I chased him around the neighborhood for about 45 minutes until he flew 20-ish feet up into a tree in a neighbor’s back yard. I called our town’s animal control office; Mr. Food It Yourself posted a notice on our town’s social media page. Out of sheer frustration I sobbed like a child on the kitchen floor for 20 minutes. The next day another neighbor caught him. They also keep chickens, so we told them they could keep the rooster. We gave them the No-Crow collar. Taking care of animals is not for the lazy. When something is wrong, you have to fix it. All told, we spent about $75 (including the price of the collar we gave away) to keep out hens safe and happy. I have no regrets. From the folk at My Pet Chicken, an awesome resource site for chicken keepers. Here is a Bio-Security guide from the USDA. Don’t be That Guy. Don’t start a poultry pandemic. As always, you can turn to an experienced chicken owner you know (or happen to run into at the ag supply…). You can also contact your local USDA extension or agricultural college/university.